DOCTORS in Northern Ireland’s hospitals will be asked to check how their colleagues are recording deaths under new proposals being implemented by the Department of Health, The Detail can reveal. The plans follow a string of controversies in recent months about how hospital fatalities are investigated, raising fresh concerns that there is a gap in accountability. Meanwhile new figures obtained by The Detail show that it can take years for some hospital deaths to be referred to the Northern Ireland Coroners’ Service for further investigation. Under current arrangements when a patient in a hospital dies, the doctor in charge of their care will decide if the cause of death is known and, if so, they will fill out a medical death certificate so the death can be registered. Now for the first time a second doctor will be asked to check the accuracy of the death certificate and confirm there are no grounds for further inquiry. In Northern Ireland doctors have a statutory duty to report any sudden or unexplained deaths to the coroner. To date no doctor has ever been prosecuted here for a failure to report a death to the coroner. However figures from the coroners’ service show that referrals from hospitals to the coroner listed as “late” range from delays of 10 months to over 10 years. For the purpose of a Freedom of Information request submitted by The Detail to the Northern Ireland Court Service, the coroners’ service considered all deaths reported three days or more after the date of death as “late”. An inquest was directed into a stillborn baby death following a landmark legal ruling 12 years after the death occurred. This will be the first UK inquest into a stillbirth. A death was referred to the coroner by a crematorium before cremation took place. A referral was made after it emerged that the deceased person had been involved in a drug trial. Two cases were re-opened which were linked to the Pseudomonas outbreak that killed four babies in Altnagelvin and the Royal Victoria Hospital’s neonatal units in December 2011 and January 2012. If a death resulted directly or indirectly, from any cause other than natural illness or disease for which the deceased had been seen or treated within 28 days of death, then doctors here have a statutory obligation to report the death to the coroner. A Mortality and Morbidity Review System (M&MRS) is currently being piloted in the Belfast Trust with plans for a regional system to be rolled out across all hospitals in Northern Ireland by 2017. It is designed to ensure that the medical certificate of cause of death completed in hospitals is reviewed for accuracy and amended if necessary. The system is designed to act as an additional safeguard to ensure that deaths are appropriately reported to the coroner. When a death is referred to the coroners’ service it will decide if a death certificate can be issued or if a post-mortem examination is needed to establish the cause of death. If a post-mortem examination shows that a death was not from natural causes, then a coroner may decide to hold an inquest. The purpose of the inquest is to establish who the deceased person was and how, when and where the death occurred and to provide the required details so the death can be registered. - The Medical Certificate of Cause of Death (MCCD), is usually completed by the doctor who attended the deceased during their last illness. Currently, if the doctor decides that the case does not need to be reviewed internally or that it doesn’t need to be reported to the coroner, there will be no further investigation. - A relative of the deceased then takes this certificate to the registrar for Birth, Marriages and Death at their local council offices where the information is reviewed and the death is registered creating a permanent legal record of the death. In a previous article The Detail revealed that between January 2010 and May 2013, 56 cases were reported late to the coroner. For the purpose of our request, the coroners’ service considered referrals received three days after the date of death as “late”. In a new Freedom of Information request we asked for a further breakdown of the time delays as well as the reasons for the delay. We were told by the coroners’ service that seven of the cases were incorrectly listed as late because the dates had been inaccurately recorded by staff. One case was referred to the coroner by the crematorium before cremation and there were three cases where the consultant/GP reported deaths on return to work after a bank holiday weekend. A further seven cases were initially reported to the coroner and closed, but were considered as late because they were re-opened when new information warranted further investigation. Two of the deaths that fall into this category were re-opened because of possible links to the pseudomonas outbreak. Click here to see The Detail’s previous investigations into the pseudomonas baby deaths that occurred in Altnagelvin and the Royal Victoria Hospital. Nineteen cases were referred to the coroner late because the death certificates were rejected by the Registrar for Births, Deaths and Marriages. Eight cases were not originally referred to the coroners’ service but were reported when new information became available after the death. This can occur when internal investigations such as Serious Adverse Incidents (SAI) uncover new information. In this category one case was referred late because the deceased was involved in a drugs study at Craigavon hospital but this information had not been passed on to the Royal Victoria Hospital where they died. In a previous story The Detail revealed that the Attorney General John Larkin wrote to the Northern Ireland Assembly’s Justice Committee alerting them to a weakness in legislation that means his office has no power to secure access to health trusts’ confidential documents, such as Serious Adverse Incident reports. Mr Larkin is seeking an amendment to the Legal Aid and Coroner’s Courts Bill which would give him the power to compel the release of documents and computer files from hospitals. Giving evidence to the committee last week Mr Larkin said it was important that “an independent set of eyes” had access to the documentation surrounding hospital deaths. The coroners’ service also provided us with the ten longest referral times over the last three years. The longest time period relates to a stillbirth that occurred in 2001 which was only opened by the coroner after a landmark legal case last year. Following a previous story by The Detail, the Attorney General directed in July 2012 that an inquest should be held into death of baby Axel Desmond, who was stillborn in Altnagelvin Hospital in 2001. However, senior coroner John Leckey said he believed that he would be acting outside of his legislative powers if he carried out an inquest into a stillbirth. A legal challenge by Mr Larkin against the coroner’s decision was dismissed, but in November 2013 the Court of Appeal issued a ruling that the coroner could hold an inquest into Axel’s death. Other cases were re-opened either at the request of a family or at the direction of the coroner. The latest findings come just months after The Detail revealed shortcomings in how hospital deaths were being reported in the Northern Health and Social Care Trust. 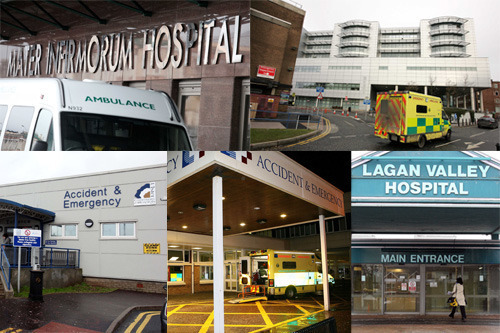 In a statement to the Assembly in April 2014 the Health Minister Edwin Poots acknowledged that there had been failings in the quality of care and governance provided by a number of hospitals here in recent months. Mr Poots announced a series of plans to improve the way the health service is run in Northern Ireland, including appointing a group of experts led by the former Chief Medical Officer of England, Sir Liam Donaldson. The Health Minister also referred to the implementation of a Mortality and Morbidity Review System (M&MRS) which involves new measures to ensure that the causes of all deaths in hospitals here are reviewed and accurately recorded. The system aims to provide additional scrutiny of the death certification process and will act as an additional safeguard to ensure that hospital deaths are appropriately reported to the coroner. In 2003 the role of the Coroners’ Service in England and Wales was thrust into the spotlight following revelations that Dr Harold Shipman – a GP based in Hyde – had killed at least 215 of his patients. The Shipman Inquiry found that he was able to evade the notice of coroners’ through the issuing of death certificates stating natural causes as the cause of death. In the aftermath of the inquiry a major change in the death certification system was recommended across the UK, whereby every Medical Certificate of Cause of Death (MCCD) should be vetted by another doctor or a medical assessor. However this was not implemented anywhere in the UK. Now under the new M&MRS system currently being piloted in hospitals in the Belfast Trust, it is anticipated that every medical certificate of cause of death in this trust area will be reviewed and amended if necessary by a second member of the medical staff. A Department of Health spokesperson said an M&MR system would be rolled out across all health and social care trusts over the next three years and would help identify if appropriate action was taken to report a death to the coroner.